Are you looking for an experienced landscaper with a complete list of landscaping services? Look no further! 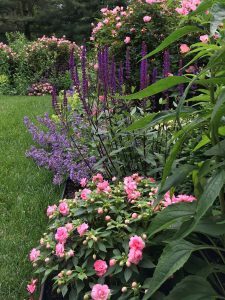 Burnett’s Landscaping in Salem, Connecticut has an experienced and dedicated team that will always go above and beyond to provide our clients with our top-notch services. We will work with you on almost any project, whether you are just starting or near the finished stages. On-site Estimates or Design Consultations: On-site estimates and/or Design Consultations are the most important steps when starting a new project. 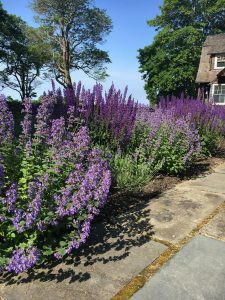 Meet with a skilled landscape professional experienced in all aspects of landscape design, construction, and installation. 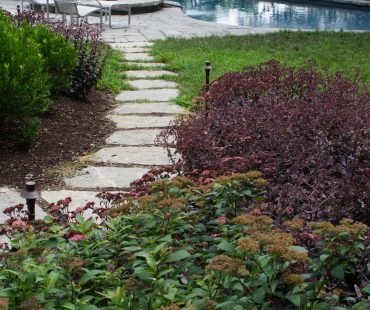 Complete Garden Installation: We offer a complete garden installation which includes planting bed preparation with soil and compost. Planting of Trees, Shrubs, Perennials, Annuals, & Bulbs according to the planting plan that has been prepared for you. Mulching: Burnett’s Landscaping offers mulch with premium shredded bark mulch. Mulch is used to improve moisture retention and provide a tidy, finished appearance. Routine Garden Care: We offer Routine Garden Care using a periodic maintenance schedule suited to you and the needs of your property. Walks & Patios: Constructed with a full base suitable for the Connecticut climate. 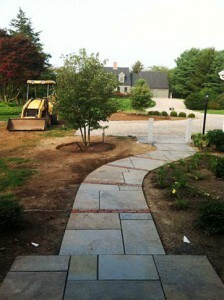 In your choice of Bluestone, Brick, or Concrete Pavers. There are numerous styles and colors from which to choose. Retaining Walls & Garden Walls: Attractive and practical. 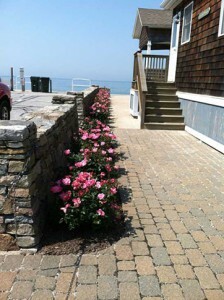 Our Retaining Walls & Garden Walls are available in many styles and colors. Natural Fieldstone Walls, Steps, & Boulders: Our stone masons can install a unique, hand-crafted project made from local, natural fieldstone. Granite Cobble Edging & Aprons: A classic look that is suitable for many locations. Water Features and Installation: An attractive and fun addition to any landscape! Grading & Drainage: Grading & Drainage is always a significant consideration before and during any landscape project. Gravel Driveways: New driveway installations or grading and topdressing of existing surfaces. Topsoil Installation & Grading: After careful site analysis, the addition of the proper amount of soil material. Grading to ensure correct drainage patterns. Erosion Control: Usually in the form of blankets, matting, fabric logs, or geotextiles. Hydroseeding: water, seed, fertilizer, & mulch for pennies per square foot. Sod Installation: An immediate lush, green lawn. Want to keep in touch with us? Like us on Facebook for the latest updates and information from the Burnett’s Landscaping team!